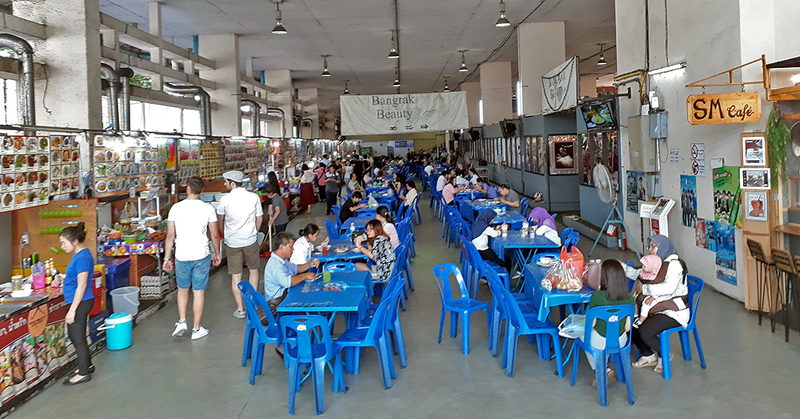 Eu suava o dia todo, afinal, Bangkok é considerada a cidade mais quente do mundo quando se considera a média anual. Mas os seguintes aspectos foram diferentes em cada visita: mais tráfego, mais habitantes, mais problemas ambientais e mais turistas de todo o mundo. 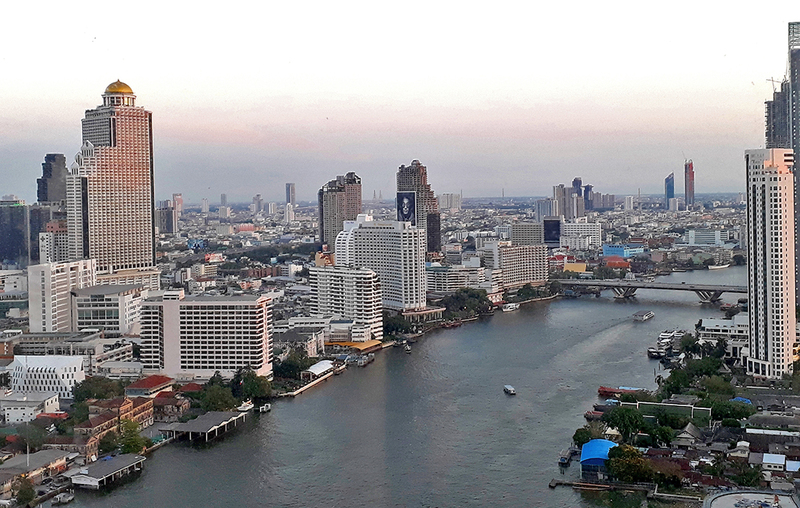 Bangkok tem 8 milhões de habitantes e é visitada anualmente por cerca de 20 milhões de turistas, o que a torna uma das cidades mais visitadas do mundo. e os famosos Tuk Tuks que estão nas ruas em todos os lugares. Com toda essa oferta de comida barata nas ruas, você deve sempre estar atento às condições de higiene nas quais elas foram preparadas. A cidade tem mais de 400 wats (templos budistas). 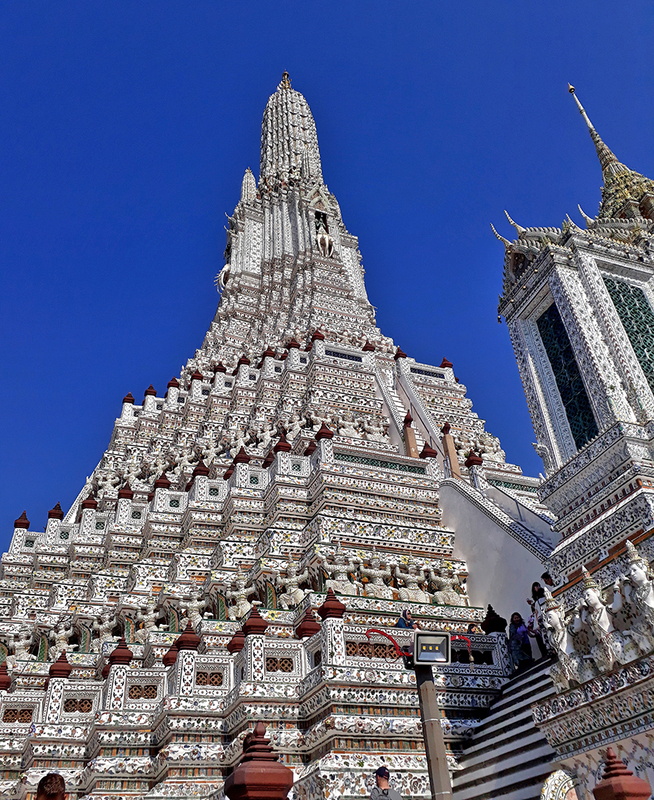 O mais significativo é o Wat Phra Kaeo, que abriga o chamado “Buda de Esmeralda” e um dos mais cultuados em todo o país. 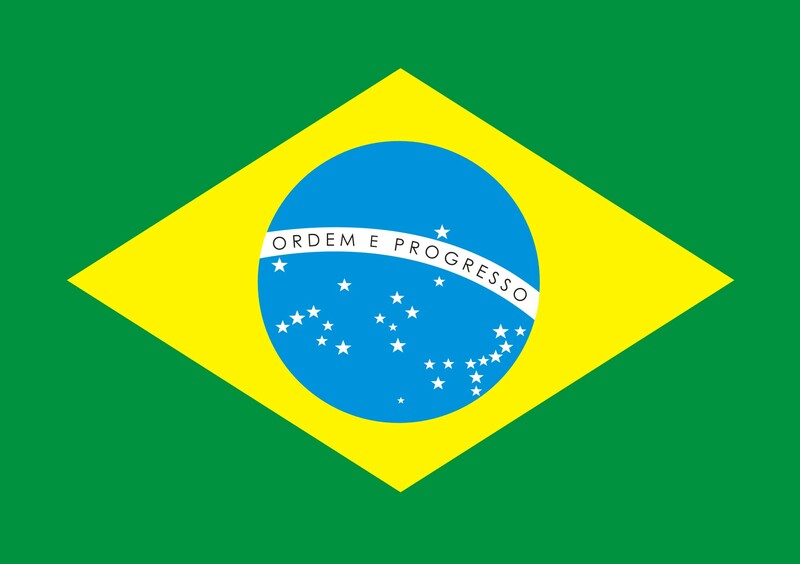 Reserve tempo suficiente para que essas visitas (Templo e Grande Palácio) sejam um mergulho neste mar de cores, ouro, arte, espiritualidade e religiosidade. 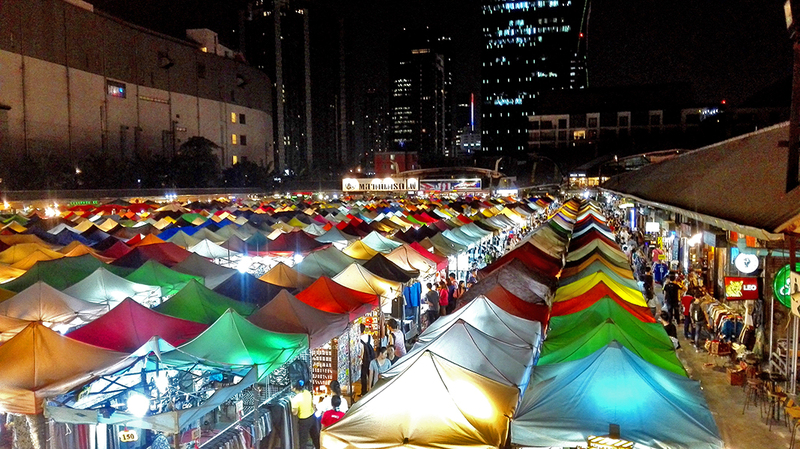 Há muitas ofertas para passear em Bangkok e excursões de 1 dia na área circundante. e também aos igualmente famosos e fascinantes “Mercados Flutuantes”, que existem atualmente apenas fora da metrópole. 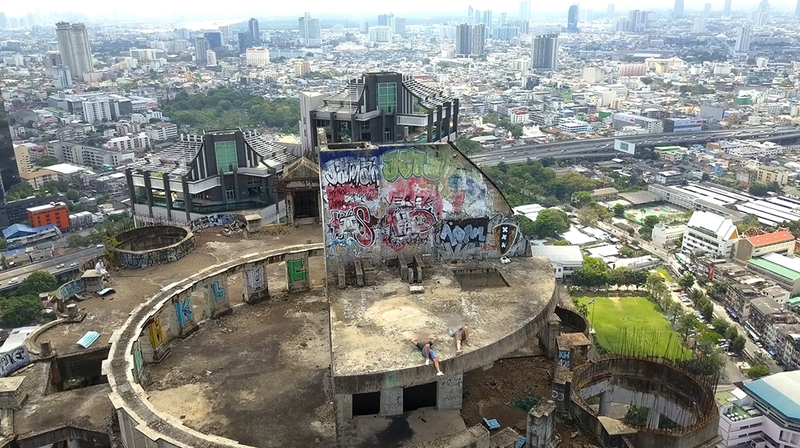 Como uma visão do tipo bastante questionável ou mesmo horrível é “Bangkok Ghost Tower” considerado. Apesar da mais estrita proibição, muitas pessoas tentam escalar o prédio, por causa da iminente deterioração, uma visita que chega a ser perigosa. 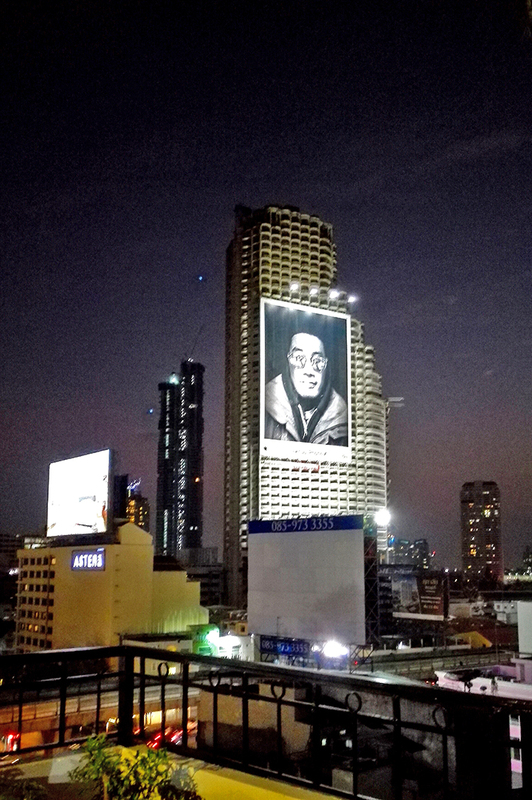 Este marco arrepiante de Bangkok é uma enorme concha com 49 andares planejada como um arranha-céu de luxo, mas falhou, hoje a Torre Fantasma é considerada o “Marco do Terror” em Bangkok. Hoje é um objeto popular para grafiteiros. E tornou-se uma “aventura” para os turistas que tentam visitá-lo com o intuito de chegar até o topo para observar a cidade. Há também rumores de que o prédio fica em um antigo cemitério e, portanto, as almas de seus antigos habitantes ainda “assombram” os visitantes. 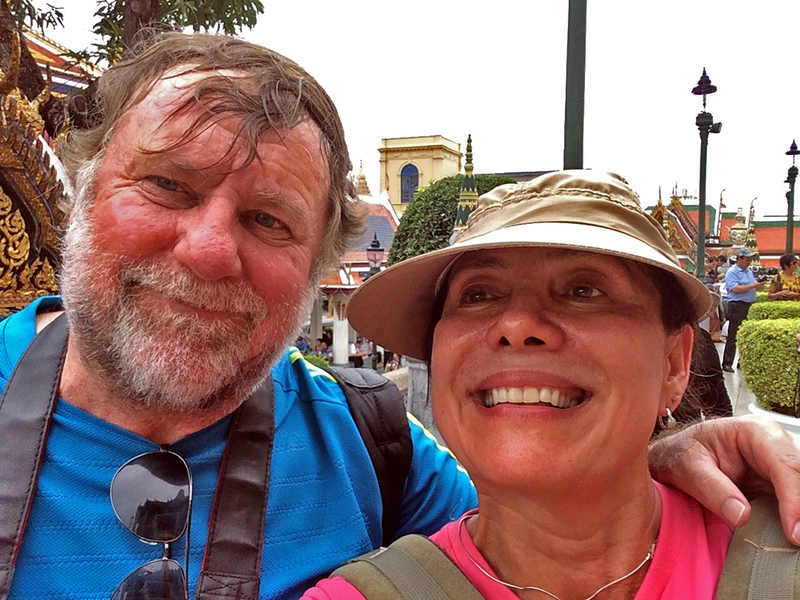 Marcia e eu aproveitamos bastante nossa visita a Bangkok e certamente ainda voltaremos a Tailândia, como eu disse “calorenta e sempre fascinante”. 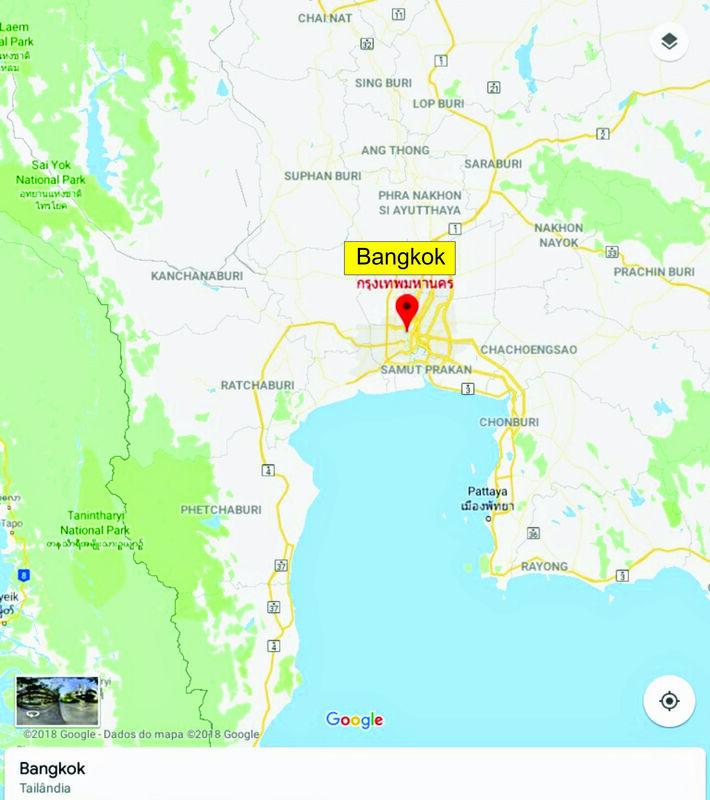 ich war den ganzen Tag nur am Schwitzen, schließlich ist Bangkok ja auch im Jahresdurchschnitt die heißeste Stadt der Welt. Ganz anders war jedoch bei jedem Besuch das Folgende: mehr Verkehr, mehr Einwohner, mehr Umweltprobleme und mehr Touristen aus aller Welt. 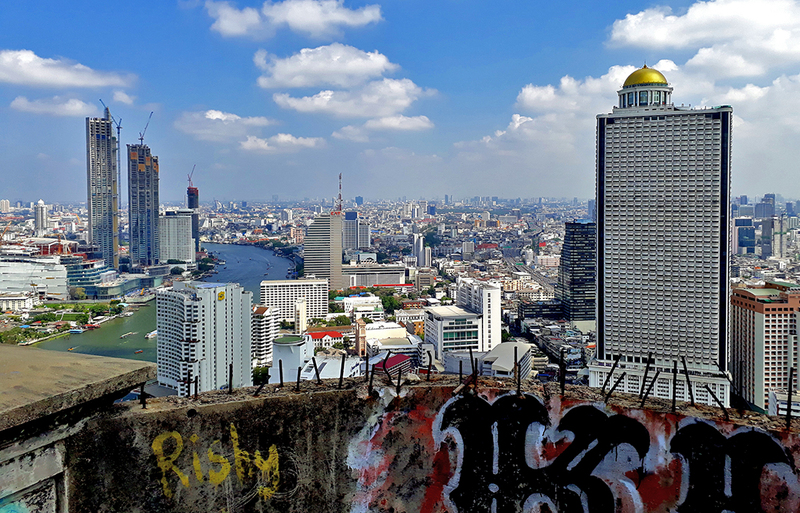 Bangkok zählt 8 Millionen Einwohner und wird jährlich von etwa 20 Millionen Touristen besucht, das ist wieder Platz 1 der meistbesuchten Städte der Welt. und den berühmten Tuk Tuks auf den Straßen überall. Bei all den so sehr günstigen Essensangeboten auf der Straβe sollte man sich immer der unterschiedlichen Hygienestandards bewusst sein. In der Stadt gibt es über 400 Wats (buddhistische Tempelanlagen). 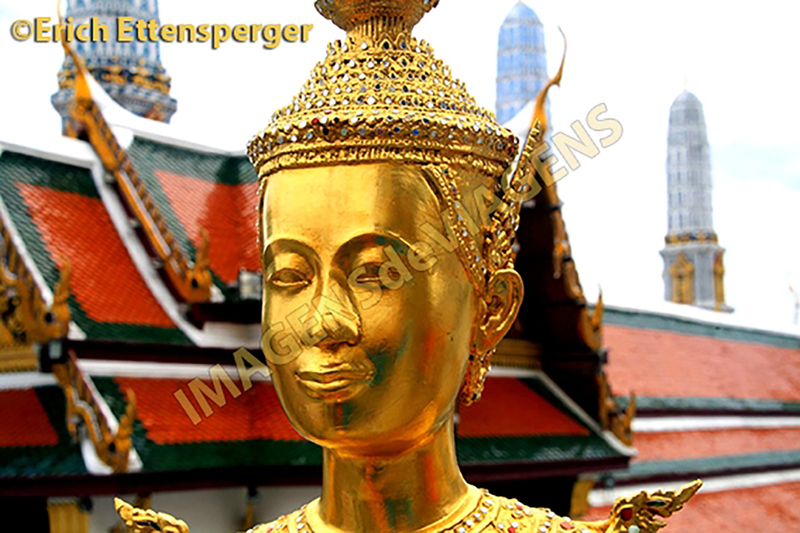 Der bedeutendste ist der Wat Phra Kaeo, der den sogenannten „Smaragd-Buddha“ beherbergt und landesweit eine hohe Verehrung genießt. Planen Sie für diese Besuche (Tempel und Grosser Palast) genügend Zeit ein, um tief in dieses Meer von Farben, Gold, Kunst, Spiritualität und Religiosität eintauchen zu können. 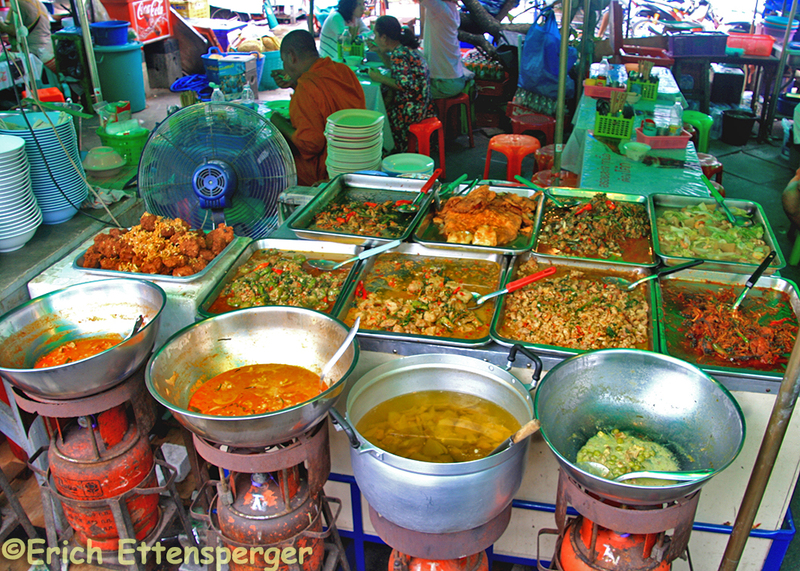 Es existieren sehr viele Angebote für Sightseeing in Bangkok und 1 Tages-Ausflüge in die nähere Umgebung. und auch die ebenfalls berühmten und faszinierenden „Schwimmenden Märkte“ existieren heute allerdings nur noch außerhalb der Metropole. werden. Trotz eines strengsten Verbotes versuchen viele Personen auf das Gebäude zu steigen, wegen der drohenden Baufälligkeit ein nicht ganz ungefährliches Unterfangen. Objekt und Abenteuerpiste/Aussichtsplattform für Backpacker. Gerüchte besagen zudem auch noch, daβ das Gebäude auf einem ehemaligen Friedhof steht und somit die Seelen seiner Bewohner immer noch „umherspuken“. 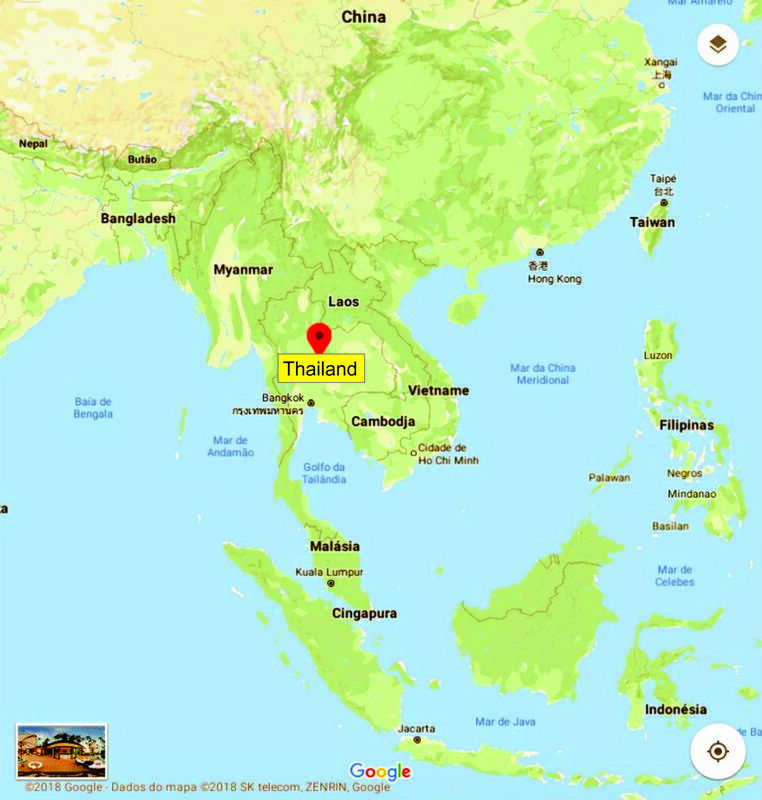 Marcia und ich haben unseren Aufenthalt in Bangkok sehr genossen und werden mit Sicherheit wieder nach Thailand kommen, wie gesagt schwülheiss und immer faszinierend…!!! 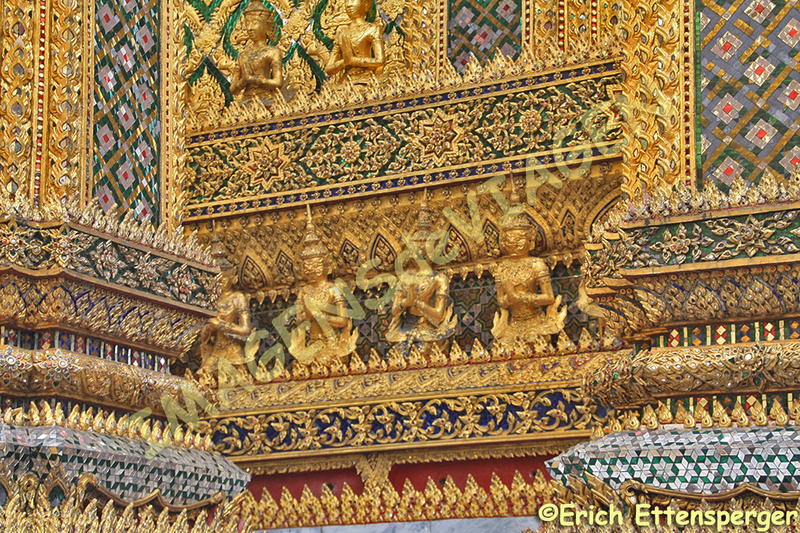 I was sweating all day long, after all, Bangkok is considered as the hottest City in the world on an annual average. 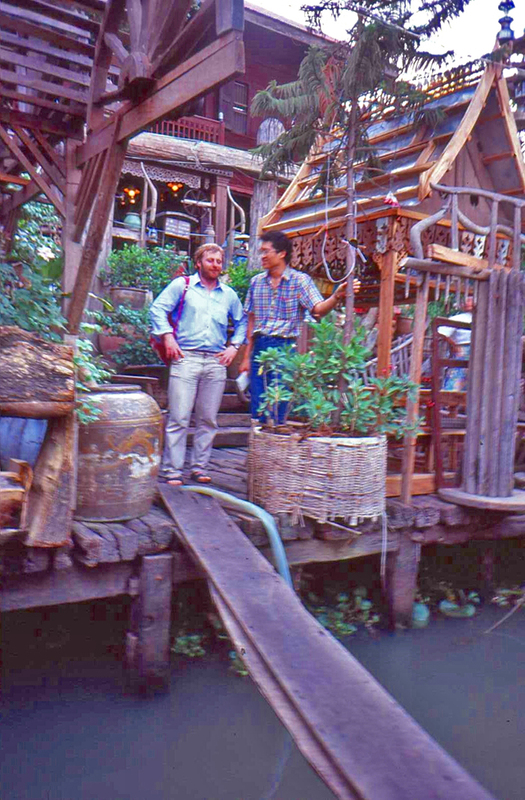 But the following was very different with each visit: more traffic, more inhabitants, more environmental problems and more tourists from all over the world. 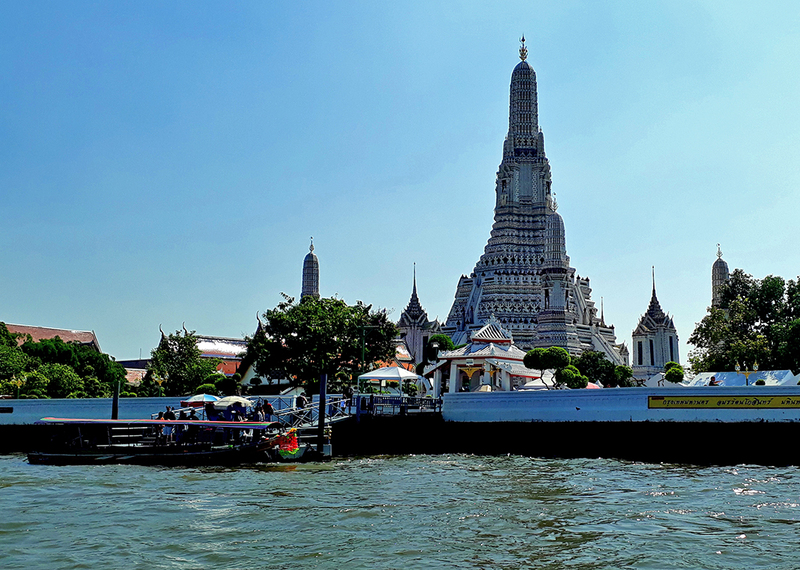 Bangkok has 8 million inhabitants and is visited annually by about 20 million tourists, which is again one of the most visited cities in the world. 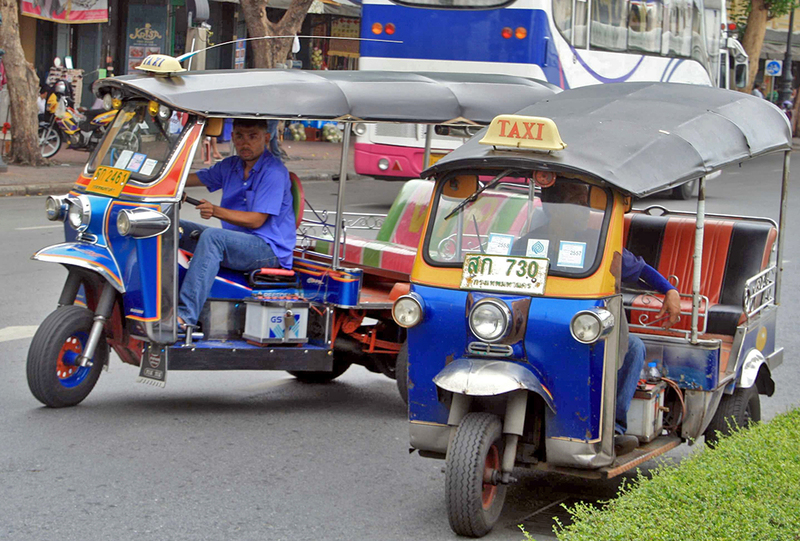 and the famous Tuk Tuks on the streets everywhere. 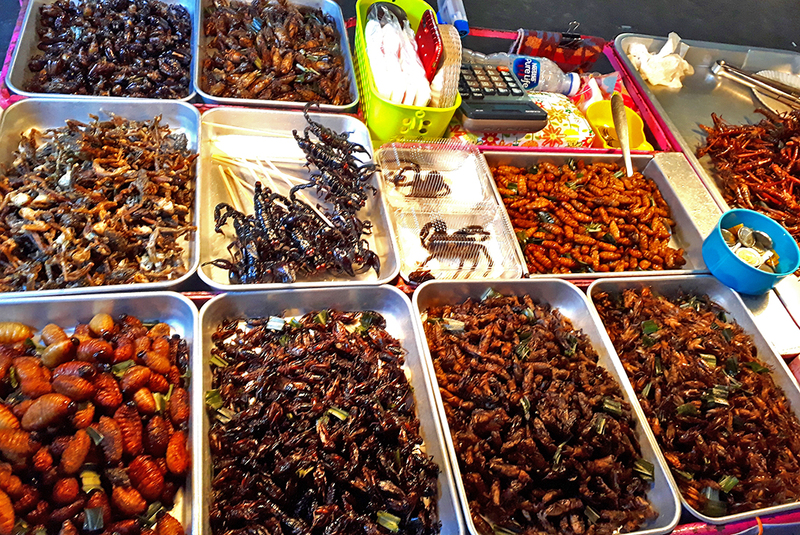 With all the very cheap food on the street, you should always be aware of the different standards of hygiene. 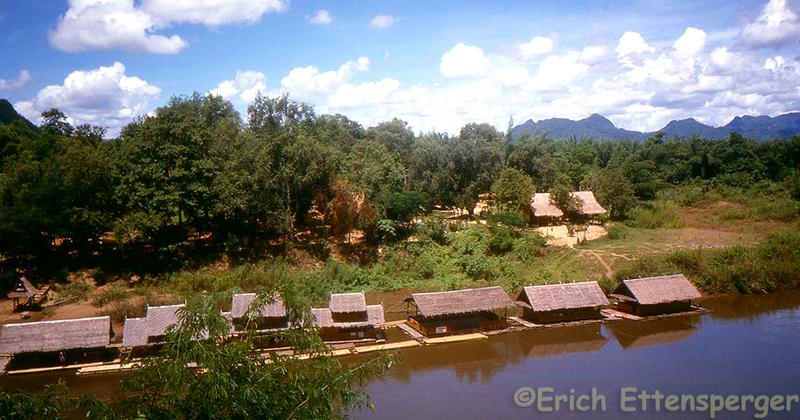 The city has over 400 wats (Buddhist temples). 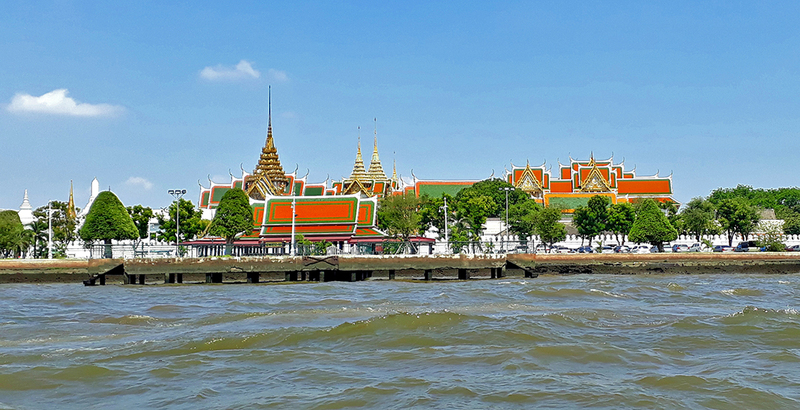 The most significant is the Wat Phra Kaeo, which houses the so-called “Emerald Buddha” and enjoys a high level of worship throughout the country. 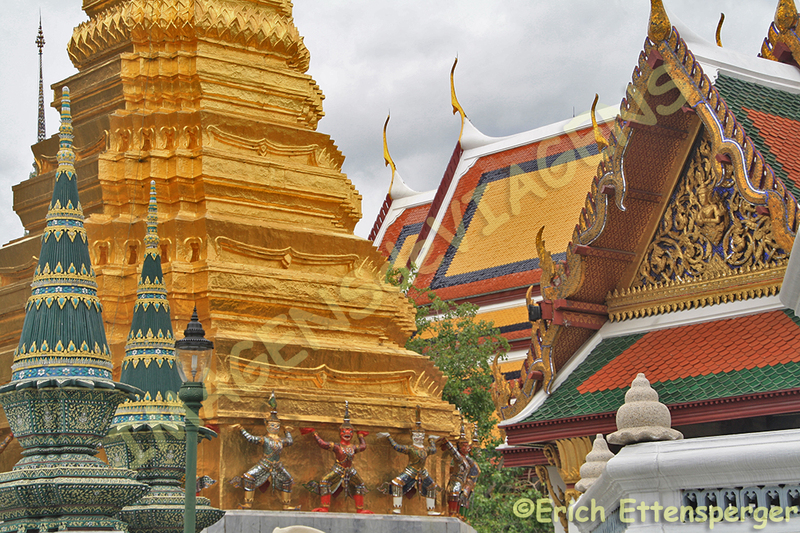 Allow sufficient time for these visits (Temple and Grand Palace) to immerse yourself in this sea of colors, gold, art, spirituality and religiosity. 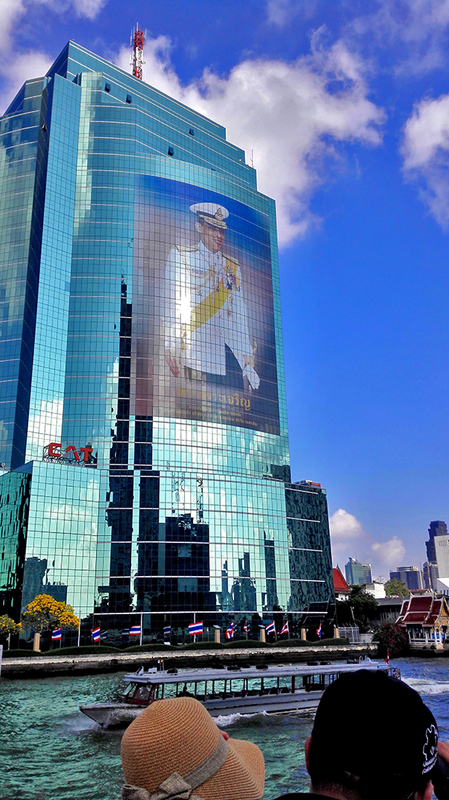 There are many offers for sightseeing in Bangkok and 1 day excursions in the surrounding area. 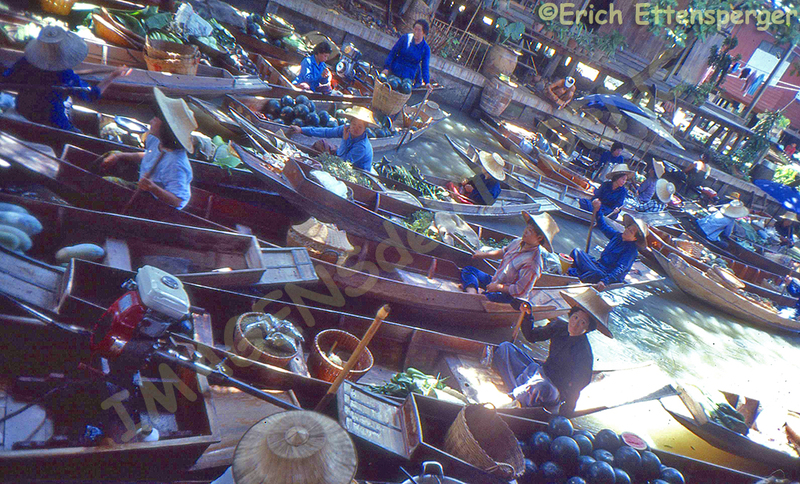 and also to the equally famous and fascinating “Floating Markets” which however exist nowadays only outside of the metropolis. 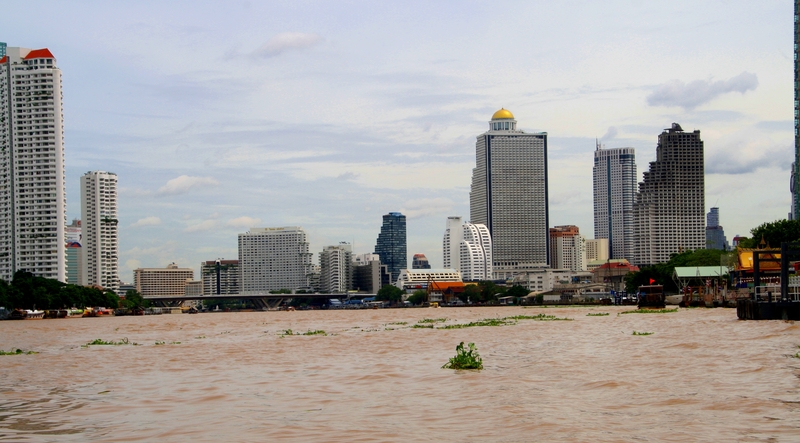 As a sight of the rather questionable or even horrible kind is “Bangkok Ghost Tower” considered. 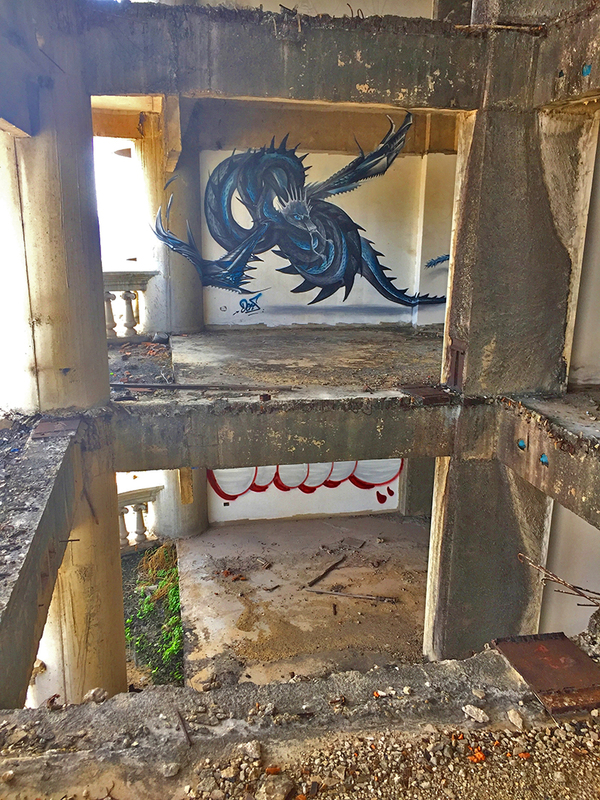 Despite a strictest ban many people try to climb the building, because of the imminent dilapidation a not entirely harmless venture. And an adventure piste / observation deck for backpackers. There are also rumors that the building stands on a former cemetery and thus still “haunts” the souls of its inhabitants. 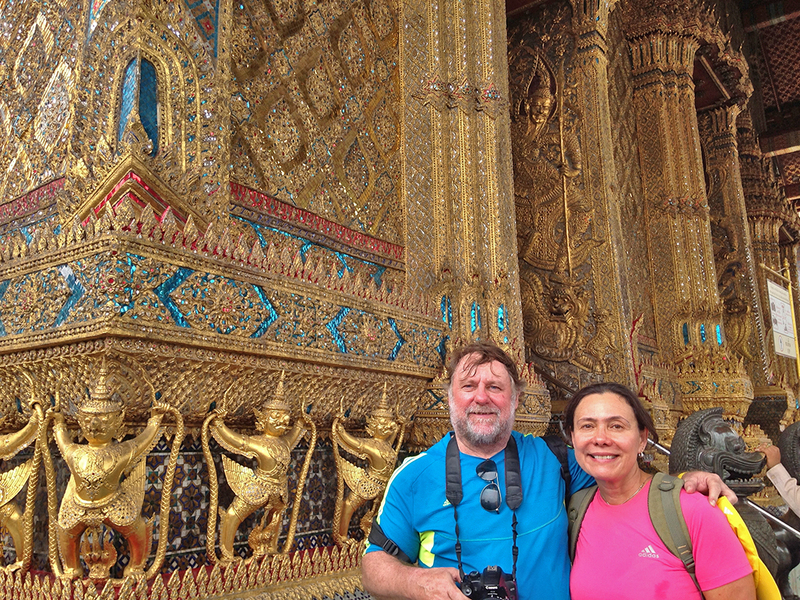 Marcia and I enjoyed our stay in Bangkok very much and will certainly come back to Thailand, as I said sultry and always fascinating … !!! 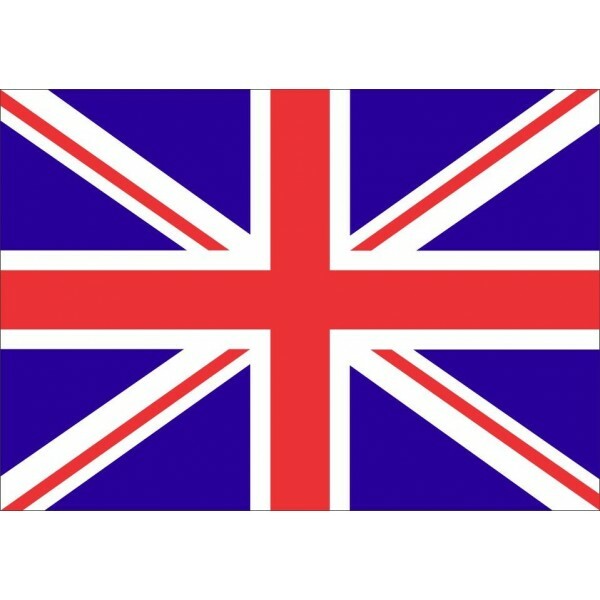 Note: If you want to follow our “Travels” on the blog, simply click on “Seguir” in the lower right corner, you will be then automatically informed in the future. You can continue traveling with us with our book Brazil´s 66 Beautiful Sites (Amazon) und 66 x Brazil – A Mosaic of Beauties (Apple).